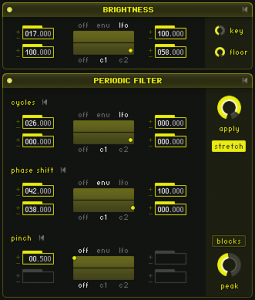 NI Reaktor Lazerbass is full of character and signature sound before you even begin to turn any of the knobs. Which is probably why it’s so easy to make a bass like this classic phased slapback style synth. Whether you produce funk, rock, mainstream pop or something a little more…modern, you will be able to appreciate the simplicity of this synth and just how easy it is to make using NI Reaktor Lazerbass. 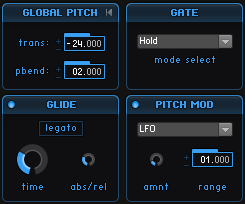 Pitch it up for a lead, add glide for an FX, swap waveforms in the oscillator for another instant instrument, etc. So yeah, it’s flexible. If you are unfamiliar with Lazerbass, don’t worry. In a few minutes you will have a better understanding to work with it and what the various features do. It really is an intuitive synth to use, which cannot be said about many of the instruments and ensembles made in this beast we call Reaktor. This sound starts out with loading a Dual Sawtooth waveform into the oscillator panel. Since this is a dual wave based sound, we can get a little extra interest out of parameters like partials and fundamentals. Setting the Partials parameter to 230 is a good way to save a little CPU while also affecting the overall resolution of the sound. The Fundamental parameter will only affect one of the parallel oscillators in this panel. Transposing the pitch up an octave will only affect the partials, which is only affecting one of the parallel oscillators. So as you can quickly glean from this one panel, NI Reaktor Lazerbass has a unique approach creating sounds that are easily layered and spread out. The Beating parameter only has to do with form, not pitch, so the detuning that takes place is also pretty unique. These Ratio panels are used to affect the Timbre of the synth through partials and patterns. You can see the visual representation of how they are working by clicking on the Ratio option in the main spectrum window at the top of the NI Reaktor Lazerbass interface. The Attenuation panel is also used to change the timbre of the overall sound through partials and patterns. These two panels deal directly with the partials in play. The OSC Phase panel affects the phasing of individual partials, while the Part Beating works on the beatings of individual partials in a less obvious way than the beatings introduced via the oscillator panel. These three panles play a very important role in sound design within NI Reaktor Lazerbass. They are set up and then used to modulate various parameters throughout the synth, but mainly in the Brightness and Periodic Filter panels. These four panels are fairly self-explanatory, as they are a common element of most modern synths and sound design. 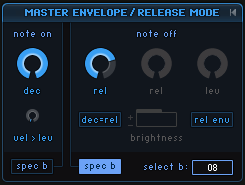 The Master Envelope and Release Mode panel is where you can tweak the Note On and Note Off parameters. And, of course, the Panning and Master Amp panels are here to make sure you can have individual control of overall volume levels and stereo spread in NI Reaktor Lazerbass. In this case, we are making a bass synth (primarily) so the sound is kept fairly narrow. I mentioned it before, but make sure you look at the different corresponding views in the NI Reaktor Lazerbass spectrum window to actually see the visual representation of the parameters you are setting and how they affect the sound as you are designing it. Below is a small audio sample of this synth in action alongside some drums.